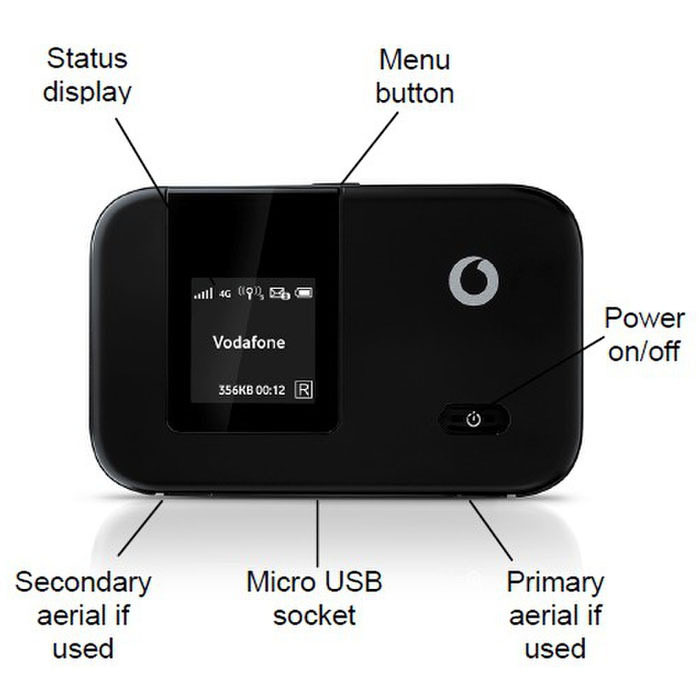 Since the end of November 2013, Vodafone offers a new portable mini router called “Mobile Wi-Fi R215”. The unit dominated LTE and all relevant previous standards. The R215 LTE router is designed for travel companion rather than purely stationary use. Therefore, the package also advertises with the slogan “Wi-Fi everywhere in your pocket”. We have tested the Vodafone R215 detail on the heart and kidneys. Vodafone R215 is made incidentally by Huawei and is identical to the E5372 – just provided with Vodafone brand. If the R215 is SIM unlocked, of course, other providers SIM cards can be used with it. Huawei E5372 is original from Huawei, so many features are pure and not customized. So someone ask whether they can use the E5372 with Vodafone SIM, the answer is yes. Technical parameters and first impression We were surprised by the first dimension, with only 9.9 x 6.2 x 0.14 inches (HxWxD), the Vodafone R215 actually fits into any jacket pocket inside. With battery, we measured a weight of 97 grams, but we could not quite understand the 130g specified by Vodafone, perhaps with the box. In this sense, the router weighs so less than a bar of chocolate. Visually, it is in itself nothing to complain about. The housing is made of black matte plastic, so that the router is not comparable with a high quality smartphone, but never feels cheap. On the left side is an screen which measures 2.5×2.5 inches and operation pops up the most important results. Inserting the battery and SIM card Regarding the technical data, the R215 is absolutely convincing. The R215 hotspot supports LTE Category 4, so it can be used in combination with tariffs, which offer up to 150 Mbit/s download rate. In addition, the operating via HSPA+, HSIPA, UMTS, EDGE and GPRS is possible. However, unfortunately Vodafone R215 only support the frequency bands at 800, 1800 and 2600 MHz, so that the use of 4G abroad is a matter of luck. But it can still use in European countries. In 3G mode that looks a bit different. When traveling to the USA, South America, Africa, Asia and Oceania, there should be no problem, since all major bands (850, 900, 2100 MHz ) are covered. We come to the next core of the R215, the WLAN module. If necessary, R215 can establish a hotspot with little effort. Up to 10 wireless devices can then connect to the Internet. It requires only a single Sim card in this scenario. This is an interesting method for those who want to connect several terminals on the road or in a hotel such as tablet, laptop, smartphone. The WiFi is supported with 2.4 or 5 GHz and in the standards 802.11 b/g/n. Thus, data rates up to 300 Mbps are possible. Unfortunately, there is innately no internal memory (other than a 6 MB large system cache). However, up to 32 GB via Micro SD Card are extendable. Files can be loaded into and from the memory. Other connected users can also access other devices and read the files. As befits a portable 4G router, an external antenna can be connected, of course, if the receiving site is not ideal. Two TS9 ports are located on the underside (MIMO 2×2).